Could the Chinese Super League overtake MLS as the hottest football destination outside Europe? After a string of big-money signings, the Chinese Super League (CSL) looks set to challenge Major League Soccer (MLS) as the hottest football destination outside Europe. Guangzhou Evergrande's record-breaking $45 million signing of Jackson Martinez from Atletico Madrid is a huge statement of intent for football in China. The 29-year-old Colombia striker joins ex-Chelsea midfielder Ramires and former Serie A duo Gervinho and Fredy Guarin as other big signings in the CSL during 2016. Brazilian stars Robinho and Paulinho will be teammates of Martinez at Guangzhou, where he will play under former Chelsea and Brazil boss Luiz Felipe Scolari. While MLS targets top names coming to the end of their playing days - Steven Gerrard, Andrea Pirlo and Frank Lampard are good examples - the CSL is attracting players either approaching or already in the prime of their careers. Ricardo Goulart, 24, left Brazilian team Cruzeiro for Guangzhou as a title winner and one of the league's top goalscorers. He was recently called-up to the Brazilian national squad, despite steering away from the traditional routes when he decided to leave Brazil. Simon Chadwick, Professor of Sports Enterprise at the UK's Salford University, says China is intent on making its mark on the world stage. "It's a brand positioning statement. It's telling the world 'We're here and this is what we're doing,'" he said, as reported by CNN. "In terms of China's reputation to be an important nation globally, to be good at football is a large part of that. 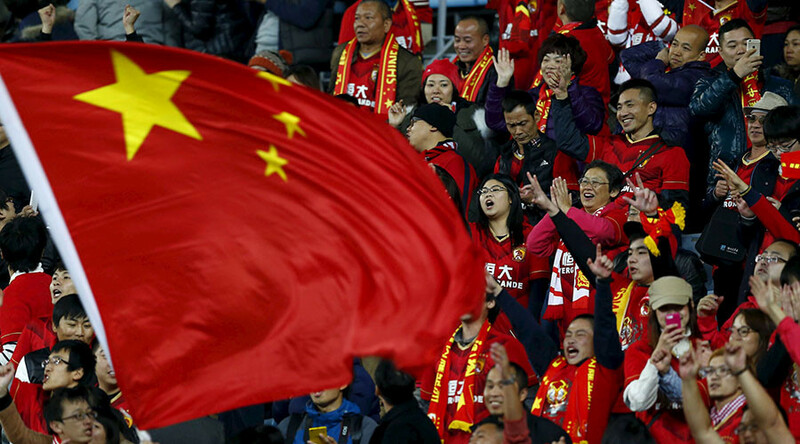 "China wants to build the world's biggest sport industry worth $850 billion by 2025 and part of that strategy is to host the World Cup and win it. To do that it needs to learn how to play football, so it's now acquiring and developing assets to enable this." Leading coaches like Sven Goran Eriksson, Alberto Zaccheroni and Mano Menezes have been attracted to China by the riches on offer. The money boom in the CSL has been driven by the country's president, Xi Jinping. A huge football fan, he was annoyed at China's failure to establish itself on the world stage and has encouraged wealthy businessmen and companies to get involved to help grow the game. He has also backed a government scheme to get children playing football at school, which has set a target of 20,000 schools playing the sport on a weekly basis by 2017. Chinese internet giant Alibaba has invested heavily in Guangzhou, working to create an infrastructure at the club which will make it less reliant on foreign players. With help from Real Madrid, Guangzhou built what is thought to be the largest football academy in the world to help develop the next generation of players. While youth development will give China solid foundations on which to build the game, a new five-year, $1.25 billion television deal will ensure clubs can keep targeting top names. Despite China's moves to position itself as a leading power in football, which have included investment in Premier League giants Manchester City, Professor Chadwick says it still has a number of issues to address. "Chinese football historically has had a governance problem," he said. "While corruption standards are improving, they are still not good enough. "So anyone going to play in China has to be mindful that there may still be some problems. For example, payment of fees, be it transfer fee or wages."